An hvlp paint sprayer will provide the results you want, whether spraying cabinets or putting the final touches on a piece of furniture. 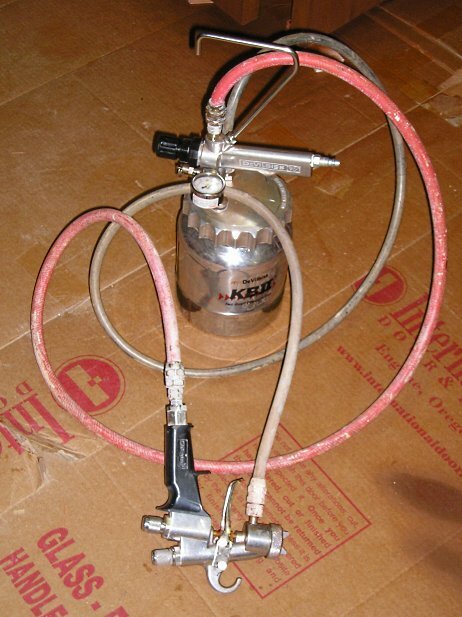 This type of paint sprayer can provide smooth “factory finish” results. Airless and conventional paint spraying systems produce very high pressures and blast the paint to the surface. The result is excessive atomization and the paint actually bounces off the surface, producing large amounts of waste called overspray. This causes the need for excessive masking and covering. Plus, regular airless paint sprayers apply a lot of paint very fast, making it difficult to achieve the smooth fine finish you want. By spraying at lower pressures the finish won’t be over-atomized, drastically reducing overspray and giving excellent results. Plus, giving you a level of control unmatched by any other paint application system. An hvlp sprayer has many advantages, when compared to other types of paint sprayers. Reduced Overspray – The mist or overspray produced by airless and conventional air powered paint sprayers drifts around the workspace and settles on everything. Plus, you are breathing this mist. Or the air filter mask, that you should be wearing, is working overtime. This is a major problem when spraying anything indoors. To combat this problem you must cover and protect everything with plastic and masking paper. This takes time and money in masking materials. This type of paint sprayer can reduce overspray by as much as 80%. Giving you a cleaner environment that needs less masking. Uses Less Paint – Since overspray is drastically reduced the amount of material wasted is reduced as well. If you are spraying expensive paints or finishes the savings could be substantial. Fine Finish – No other spraying method will provide this amount of control. The amount of material and air can be controlled with great precision producing an ultra smooth factory like finish. Easy to Use – The paint is applied slowly and in thinner coats. This gives you greater precision. Using a HVLP gun is simple requiring just a little practice. A high volume low pressure paint sprayer can be used to apply many different types of primers, paints and clear wood finishes. The best types for this paint application system are alkyd primers and alkyd finish paints. Clear wood finishes include varnish, lacquer and acrylic urethane. Oil based finishes are the easiest to spray giving the best results. Even interior wood stains can be applied with this sprayer. But, an hvlp shouldn’t be used to paint the exterior of your home. There are 2 types, turbine powered and compressor powered. Turbine powered systems use a series of multi-finned blades to produce large volumes of air at low pressures. The turbine can spin at very high rpm’s, as much as 14,000 rpm. Turbine sprayers are compact, lightweight, portable and do a great job applying many types of finishes. Here are a few rules when purchasing a turbine hvlp unit. Selection is based on the type of finish you intend to spray. Thin materials, such as oil base stains and lacquers, don’t require a lot of power. So a smaller unit will work fine. Thick materials, like water-borne polyurethanes and oil base paint, should be sprayed with an hvlp that has more power. The thickest paints and primers, such as multi-speck and acrylic/latex house paint, will require the most powerful units. These very thick materials should be sprayed with an airless and a fine finish spray tip. The difference between a small and a large more powerful unit is the turbine. The amount of blades used corresponds to the amount of pressure and amount of air the unit will produce. These blades are called stages and the more stages the more air volume, at a given pressure, you will have. A turbine unit needs a powerful electrical motor to spin the stages at very high rpm. High quality, name brand, manufactures have spent the time too properly construct and test their products. Currently 2, 3, 4 and 5 stage units are manufactured. Compressor powered systems use a piston air compressor to provide the volume of air needed. A few manufactures have units that are portable and powerful. Most standard home air compressors are not powerful enough. 3 hp or larger air compressors with a large tank, 20 gallons, will be needed for most spray applications. 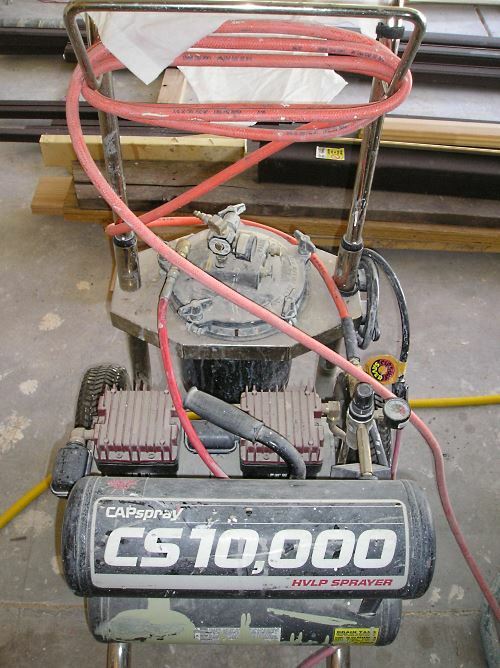 The manufactured units, like Capspray’s CS10000, has a specifically built compressor to provide the needed volume of air. This compressor-powered hvlp is more expensive than most turbines on the market. The most important part of any hvlp sprayer is the gun used. There are many manufactures and the prices range from $50 for a cheap gun, use it a couple of times and throw it away, to several hundred dollars. Always look at the recommended CFM at a given pressure and try to match the gun to your turbine or air compressor. Many guns consume large amounts of air rated in CFM, Cubic Feet per Minute, and PSI, Pressure per Square Inch. A good quality hvlp paint sprayer, with the proper gun, will produce beautiful finishes for many years. 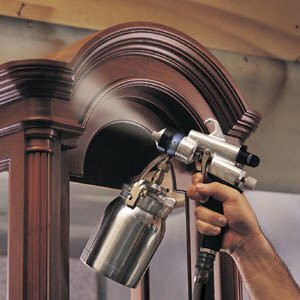 Whether your needs are cabinet refinishing or serious wood working an hvlp fine finish sprayer will easily meet your needs.